Choosing a golf ball that matches your style of play, plays a key role in improving your scores. According to Golf Digest, there are some 85 models of golf balls on the market. Choosing the one that most benefits your game can be daunting. But if you begin to narrow down the choices by focusing on your playing performance and budget, making the right decision can be easier. The golf ball is the only piece of equipment you use on every single shot; you should be sure you have the best ball for your ability. A good place to begin the process of choosing a golf ball is to assess your playing ability, and identify the performance problem you are trying to remedy. If you are a beginner, you likely need more distance off the tee and a ball with less spin. Too much spin will accentuate a high-handicapper's hooks or slices. If you are a more accomplished player, your needs can be more specific. Many better players are looking for more spin to help manipulate shots around the green when chipping or pitching. This requires a softer ball. Knowing your game helps narrow the choices. 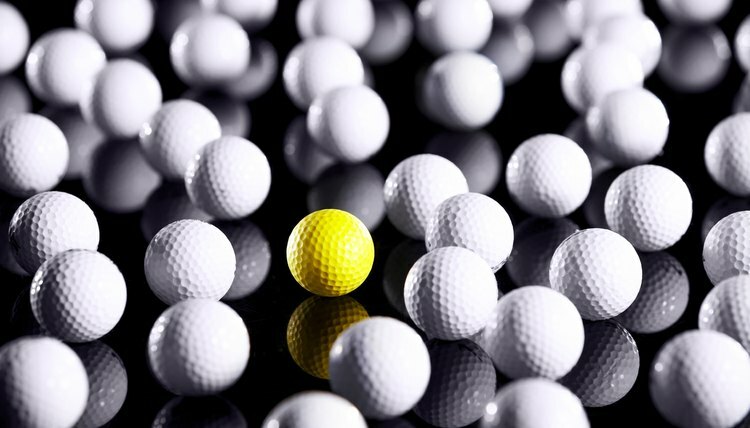 According to Golfballguide.com, the majority of the golf ball market is populated by a ball with a solid rubber core and a urethane or plastic cover. These two-piece balls are generally thought of as game-enhancement or improvement balls. Although softness or hardness can vary by the size of the core or design of the cover, these balls are good for giving you a bit more distance on your shots. The larger core gives the ball more velocity off the clubface. The two-piece ball also has less spin, helping to straighten your hook or slice. These balls are generally beneficial for mid- and high-handicappers and beginners. These three-pieces balls have a solid core surrounded by another rubber layer. The soft plastic or urethane cover surrounds the entire core construction. This design helps to give both a game-enhancement quality to the ball and a better feel for the more accomplished player. Some teaching professionals believe that if you are looking for the forgiveness of a two-piece ball, but still want some spin control to shape shots, the hybrid ball is the best choice. Mid-to low-handicap players will get the most from this kind of ball. Professionals and single-digit handicap players generally have high swing speeds. Because of this, they need a ball with a low spin ratio for maximum distance off the driver. However, they are also looking for a ball with more than average spin from their irons, allowing for a better chance to shape shots. Performance balls usually have a rubber core surrounded by one or two thin mantle layers, and then the urethane dimpled cover. They are the softest kind of ball, allowing the better player to more easily compress it at impact for better performance. Assessing how often you play, how many balls you lose in a typical round and your overall golf budget are important factors in making a ball choice. Generally, two-piece balls are the least expensive. Some low-end discount balls are ideal for high-handicappers and beginners because they are less costly and more durable. Hybrid and performance balls can be double or triple the price of discount balls and because of their softer construction, are more easily damaged during play. David W. Berner is an award-winning journalist, writer and broadcaster. HIs memoir, "Accidental Lessons," was released in February 2009. His audio documentary, "Pebble Beach Stories," celebrates the ties between golfers and famed California golf links. Berner has covered stories as diverse as the 2008 presidential election to coyote sightings in Chicago's Lincoln Park.